Hmm... you think we can make it from the Cut Chemist show to this one?!? 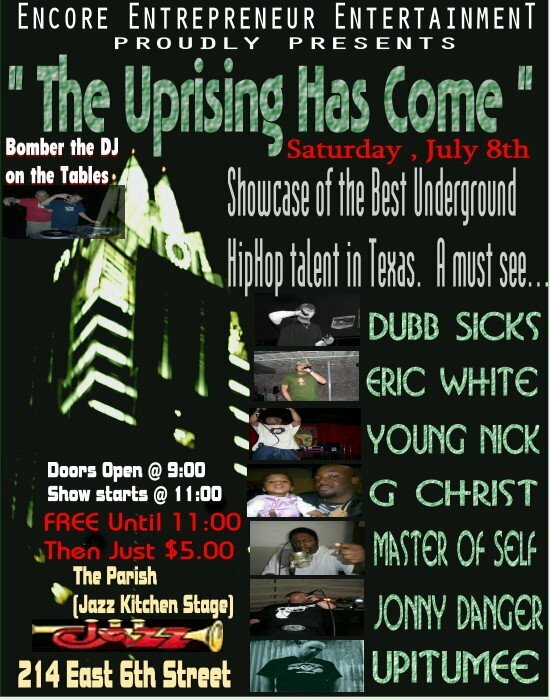 "The Uprising Has Come" is a free show at The Parish before 11pm then $5 after. 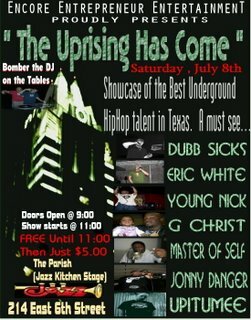 You've got Dubb Sicks, Eric White, Young Nick, G Christ, Master of Self, Jonny Danger, and Upitumee... a full line up of Texas underground! I think we can make it! Hail to the sweet naan! Man I'm so hungry! Russell Martin started out like most other emcees ...rapping every now & then here and there as a hobby. Although hip-hop was by far his first choice of music, he was exposed to every kind of music from an early age. Rock, blues, jazz, pop, classical, and of course country. Music was the outlet time and time again that he would choose to release the aggression that would arise in his life. With an extensive background in percussion ( Russell started playing drums at the age of 8) he seemed destined to have a musical contribution sooner or later. Whether it was playing the snare, tri-toms, or quads in his high school band , or just tapping on his desk, people took note of his ability. Soon after entering high school, Russell started to listen to rap more and more. Evolving in an age where the best HipHop was bred, he experienced the masters in their prime..